The State Department reaffirmed on Wednesday that the United States views the Crimean peninsula as a part of Ukraine, not Russia. Acting Under Secretary for Public Diplomacy and Public Affairs and spokesperson Heather Nauert condemned a political rally Russian President Vladimir Putin held in Crimea on Wednesday where he claimed Crimea to be a part of Russia. Nauert blasted the 2014 referendum in Crimea as to whether the region should join Russia. The "staged referendum," as Nauert put it, remains controversial as Russian troops were occupying the peninsula at the time and few international observers were present. 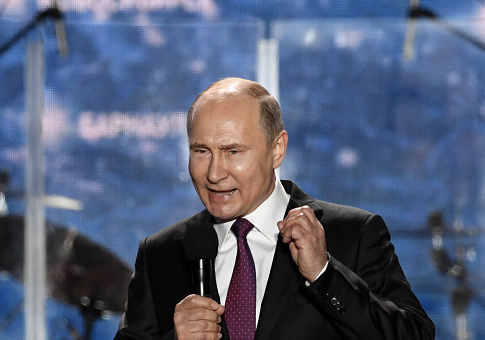 "In light of Putin’s remarks, it is important to call attention to the illegitimacy of the staged ‘referendum,’ but also to the tremendous human costs the Russian government has imposed on the people of Crimea," Nauert said in a statement. "Over the past four years, Russia has engaged in a campaign of coercion and violence, targeting anyone opposed to its attempted annexation," Nauert's statement said. "Russian occupation authorities have subjected Crimean Tatars, ethnic Ukrainians, pro-Ukrainian activists, civil society members, and independent journalists to politically motivated prosecution and ongoing repression, while methodically suppressing nongovernmental organizations and independent media outlets." Nauert also stated the Trump administration's support for Ukraine, which continues to deal with Russian troops and Russian-backed rebels in its eastern territory. "We stand behind those courageous individuals who continue to speak out about these abuses and we call on Russia to cease its attempts to quell fundamental freedoms of expression, peaceful assembly and association, and religion or belief," Nauert's statement said. "We reaffirm our commitment to Ukraine's sovereignty and territorial integrity within its internationally recognized borders. Crimea is part of Ukraine and our Crimea-related sanctions will remain in place until Russia returns control of the peninsula to Ukraine." This entry was posted in National Security and tagged Crimea, Heather Nauert, Russia, State Department, Trump Administration, Ukraine. Bookmark the permalink.